For the fourth time in ten days, the Mets were shut out. Dickey was dominant through the first five innings, surrendering just two hits, but he fell to one knee after a pitch to Russell Martin, prompting manager Jerry Manuel and a team trainer to visit the mound. Dickey appeared to be fine after the brief visit and subsequently retired Martin and Clayton Kershaw without any obvious difficulties. The two outs didn’t seem to convince Manuel, and Dickey was pulled prior to Xavier Paul‘s at-bat. Dickey appeared unhappy with his manager’s decision to take him out of the game. First off, Dickey did not “appear to be fine” and though he did retire Martin and Kershaw, the difficulties were apparent if not obvious. Dickey was definitely favoring his left leg and looked a bit stiff after the slip. That said, I can’t really get on Jerry Manuel for forcing R.A. from the game — he is, after all, the second-best pitcher in a rotation that cannot afford to lost another starter. If I am to criticize Jerry it will be for leaving him in after his first visit to the mound. Manuel has said that Mike Pelfrey needs to “pitch with more conviction”, but he should take his own advice and manage with more conviction. In the end, it didn’t matter that Dickey left, because the Mets continued their anemic effort at the plate. Clayton Kershaw scattered 7 hits in 8 innings but didn’t allow a run. The ninth inning was ably handled by Kenley Jansen, a 6’6″ rookie from Curacao who was a AAA catcher this time last year. Though, we can’t be surprised that the Mets couldn’t do anything against a catcher-turned-pitcher — they struggled against Felipe Lopez after all. In all seriousness, Jansen looks like a tough customer. He was bringing it at 95 MPH and had a pretty nasty overhand curve. At this point he is far ahead of Jenrry Mejia, to provide a comparison. 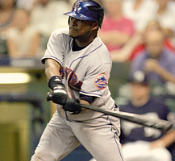 Luis Castillo was the only Met with more than one hit, going 2-for-4 including his third double of the season. Third. I know he’s missed some time but, wow. The Mets cannot leave the Left Coast fast enough. They take a day off on Monday to return home to beautiful Flushing and begin a three-game series against the Cardinals beginning on Tuesday at 7:10 PM. Jonathon Niese heads to the mound against Jaime Garcia. Ruben Tejada or Luis Castillo? Pick Your Poison. Two weeks ago, mostly everyone was singing the praises of Ruben Tejada. He appeared to be holding his own at the plate, while providing the best defense seen at the position in a decade. Since than, Tejada’s come crashing back down to earth. 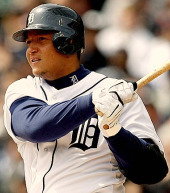 Overall, in 101 plate appearances, he is hitting .221/.299/.267 (.566 OPS. .255 wOBA.) If Tejada qualified, he would be tied for the worst hitting regular in all of baseball with Cesar Izturis (.569 OPS. .255 wOBA). Not a good week for would-be Mets second basemen. SNY’s Brad Como is reporting that Luis Castillo is headed to the DL. I guess that clears roster room for Jon Niese? I find that hard to believe – the team will probably be calling up a middle infielder… but if Ollie Perez continues to refuse a demotion, anything is possible. UPDATE: Had I read the ENTIRE Tweet, I would know that the Mets are recalling Ruben Tejada to replace Castillo. Oh well. I guess Twitter is too long for my attention span. Pretty sad, when you think about it. Johan Santana threw six scoreless innings, Jason Bay hit his first homerun in the orange and blue, and Luis Castillo drove in two runs as the Mets cruised to an easy victory in the front end of a twi-night doubleheader. Can’t say much beyond that, because I didn’t see the game … there’s this other thing I do during the day that allows me to pay the bills. So please if you have any comments to share, please do so below. Thank you! Should Luis Castillo Lead Off? Can Castillo be our leadoff man? A high OBP. Can still steal some. And not enough power for driving runners in. Perfect for when nobody is on base. I know the argument for him at number 2 is so that he can move the runner over. But why would Reyes ever really need to be bunted over? I imagine after a few pitches he’d already be on second (or even third). Why waste the out? Plus, all those Reyes triples would certainly be a lot more exciting if Luis were already on first. An interesting thought, and he does have points worth considering — particularly the last one. It WOULD be nice if someone scored when Reyes hit a first-inning triple. And you can’t argue that Castillo is an ideal leadoff hitter, assuming his OBP remains close to .400, and if he’s still healthy enough to swipe 30-35 bases. 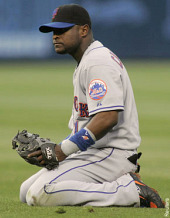 But there are two main reasons I prefer to see Reyes at leadoff. First, because after the first inning, the leadoff spot isn’t necessarily the leadoff spot any more — unless the pitcher / #9 hitter makes the third out of a future inning. And actually, the #1 spot in the order often is an RBI opportunity, because the pitcher is called on to bunt a runner into scoring position. I like Reyes hitting with men in scoring position — he seems comfortable in that situation and the numbers support it (.291 career avg. through over 660 ABs). Further, I don’t know that Reyes would steal as many bases from the two-hole, with David Wright hitting behind him. On the one hand, Wright might get more fastballs, but on the other hand, do you want him taking pitches to let Reyes steal second base? Probably not. And you might not want Reyes taking chances if Wright is on a hot streak and putting balls over fences. Which brings me to my final point. No, Reyes does not need to be bunted over to second base, but he does need an opportunity to steal — and Castillo, who takes more pitches than anyone in baseball, affords him that opportunity. Plus, you don’t mind so much that Castillo isn’t swinging, because he’s not likely to smack an extra-base hit. Further, after Reyes steals second, Castillo can bunt him to third — setting up a David Wright sac fly and a 1-0 lead. But, I still believe that the reader has something worth arguing. Post your comments below.